While we recognize and appreciate the hard work that RTD staff have engaged in to develop the draft US 36 BRT service plan, and appreciate many elements of the plan, we believe that additional service is needed in order to make best use of the new managed lanes on US 36 and adequately serve the transit oriented development at Boulder Junction. Since NW Rail will not be delivered to the NW area, at least not in any short to medium time frame, US 36 BRT is the only Fastracks service which will directly serve most NW area communities. Having a very positive rollout of BRT and broad stakeholder support will be important to public understanding that the NW area is getting a high quality transit service. If, instead, the rollout of BRT is marred by complaints about too low a level of service, this will only feed perceptions of regional inequity. BRT is important to RTD’s future. There are already two additional BRT lines in the adopted fiscally constrained 2040 RTP (SH 119 and Colfax), other lines identified in the NAMs study, the SH 7 BRT study is moving forward, and RTD will be receiving DRCOG funds for a regional BRT study. But public understanding of BRT is very low. Just as it was critical for RTD to do a great job developing the first light rail line two decades ago, to show people what light rail could mean in the Denver region, it is similarly critical that RTD to a great job developing the first BRT line. The goal should be for stakeholders, users, and the general public to love BRT the way people embraced LRT. It is worth spending a little more money to achieve this. For Boulder, it is important both to maintain great service along the Broadway corridor and to significantly improve service to the Boulder Junction area. Boulder has planned major transit oriented housing and employment growth in this area. RTD is a partner in Depot Square, Boulder Junction has already begun to develop, with the addition of the Depot Square apartments, Solana Apartments, Hyatt Place Hotel and Nickel Flat apartments. A new Google campus with up to 1,500 employees has been approved, and plans are moving forward for hundreds of thousands of square feet of additional mixed-use developments within a half mile radius. While the proposed service plan does add significant all stop service, it cuts back on express service during some peak hours, and eliminates mid day express service. This is problematic, and does not make appropriate use of the new managed lanes, as the all stop service would not use the managed lane. Peak period: The proposed service plan is pretty good for peak period service between Boulder Transit Center and Denver Union Station, with the exception of the 7-8AM eastbound and 5-6 PM westbound periods. During these 2 hours, there is a significant reduction in express service compared to today, from 8-9 per hour down to 6 per hour. We would recommend that the existing frequency be maintained during those hours. Mid-day: The proposed service plan drops the existing once an hour mid-day express service, while increasing local service from 2 to 4 trips per hour. We recommend expanding mid-day express service. While the proposed service plan does improve on peak service by making it bidirectional, it is important that there be some direct service between Boulder Junction and Union Station, and some mid day and evening service. It is true that this is a developing area, and does not yet have the densities it will in a few years, but there has already been significant development at Boulder Junction, in addition to significant existing housing and employment within a slightly larger radius. We recommend modest service enhancements, combined with a commitment to increase service as the area builds out and demand grows. Alternate runs to Union Station and Civic Center during the peak. Add low frequency mid-day and evening service, and some weekend service -once or twice an hour service mid-day and 6-10 PM on weekdays and hourly service on weekends. Commit to regularly revisiting service levels in Boulder Junction, including DIA service, as development proceeds and demand grows. This is consistent with the 2012 memo from RTD to the US 36 Mayors and Commissioners which shows minimum service levels increasing over time after opening day, towards the 2035 levels anticipated in the EIS. 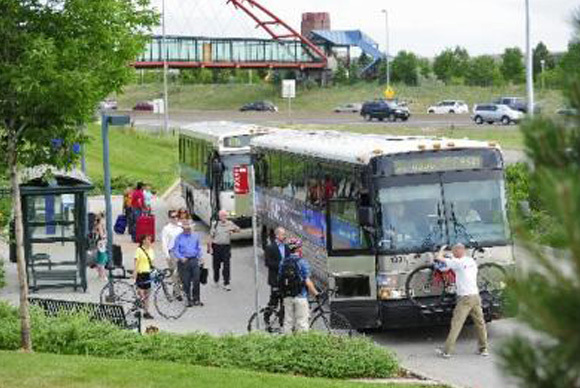 Retain direct service to the major employment centers in east Boulder, similar to the current route S service. With these changes we believe that we could get to a point where key stakeholders can come together to focus on working together to make the rollout a success, rather than arguing about the service plan.